Audio Accessory magazine started in 1976. It named as Audio Accessory, but we cover all audio products such as disc players, streamers, analogue products, amplifiers, cables, accessories and more. Our philosophy is "Loves music, love equipment and handle them perfectly. Because we think that pleasure of audio life is not only buying equipment but also making good use of it. Products are evaluated by well-known writers (both young and expert) in current Japanese audio scenes. Audio Accessory is loved by Japanese audio files for a long time. Now, the technology evolution is remarkable. However, there is no change in desire that everyone want "good music, with a great sound". 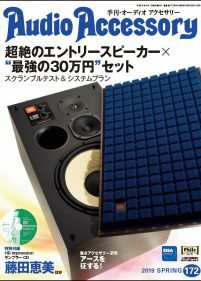 Audio Accessory magazine is also a content magazine of our website PHILE WEB (PHILE WEB is the professional website of the largest audio & visual in Japan and has 1.8 million unique users). We are pleased to be able to participate in EISA, and we will take advantage of this opportunity and propose more wonderful music life to our readers. © 1982-2019 European Imaging and Sound Association, all rights reserved.